We know that your time is precious. Therefore, the user friendly interface was programmed to make every click count. For example, to find John Smith, two clicks are needed : click on the S then click on the J and you will find John Smith! and a notice appears on your start screen when a detention is skipped. IEP/At-Risk Meeting - The student will receive help in order to complete an assignment or to receive academic help. Community Work - Sometimes the best way to learn is to amend behaviour : clean his cafeteria table, is locker, etc..
Confiscation - The Behaviour Profiler will keep track of all objects you confiscated from a student and when they should be returned. Classroom Time Out - In this instance, a student is asked to leave the classroom, stay in the hallway or sit in the 'thinking' chair. Internal Suspension - You may assign 1/4, 1/2, 3/4 or a full internal suspension day. External Suspension - You may assign 1/4, 1/2, 3/4 or a full external suspension day. 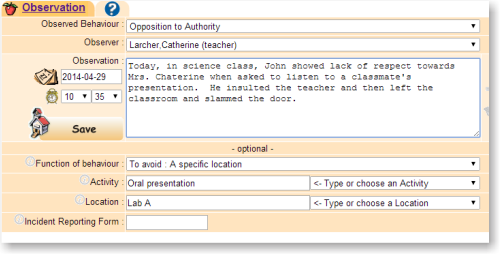 The Behaviour Profiler can export all student's history in MÉMO format towards the GPI system. 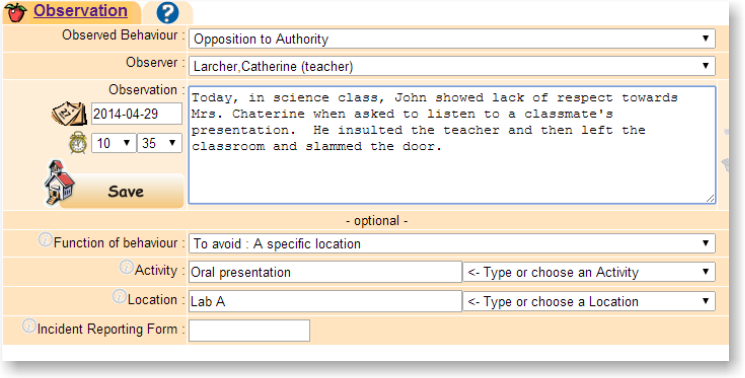 The Behaviour Profiler can read an export file from Trillium and may interact directly with it when installed on an internal server at the school board office. The Behaviour Profiler is compatible with all administrative systems capable of exportaing data to a CSV file or other format.